I must say I was somewhat in despair when I heard that Paramount was acting like a bunch of 12 year olds and holding David Fincher's Heavy Metal project ransom in return for final cut on The Curious Case of Benjamin Button. From the sounds of things, Fincher didn't much care for being pushed into a corner either and has taken the project over to Sony for further development. 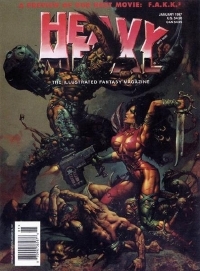 Owner of the uber popular fantasy magazine, Kevin Eastman, had this to say about the matter: "We developed it for Paramount in Januaryâ€¦ And it was time for them to make a decision [about going forward with the project] and they were at odds with Fincher over another project, â€˜The Curious Case of Benjamin Button,â€™ [because] they wanted him to reduce the running timeâ€¦ and so they said, â€˜Until you step up to do what we want you to do with Benjamin, weâ€™re not going to greenlight any other of [your] movies.â€™ And David said, â€˜Fine, f*ck you, Iâ€™m going to set up [Heavy Metal] somewhere else,â€™ so we jumped over to Sony and set it up there." Further word on the project is that the line-up of directors who are interested in tackling one of the film's 8 or 9 chapters are some pretty big names. Guillermo del Toro, Gore Verbinski, and Zack Snyder have all apparently expressed interest according to Eastman. So yeah, David Fincher just scored even more points in my books. Nice one.